While railroads continued their rapid expansion during the 1870s the decade nevertheless contained its share of issues; 1873's financial panic crippled America's economy while the Great Railroad Strike of 1877 left an ugly scar on the industry. Despite these setbacks, historian John Stover notes in his book, "The Routledge Historical Atlas Of The American Railroads," the U.S. rail network grew from 52,900 in 1870 to 93,200 by 1880 (by region the Mid-Atlantic saw a 42% increase, the South 55%, the "Old Northwest" 70%, and the West 151%). By 1880, all the states, and territories which later became states, boasted at least a few miles of track. In the west, the Transcontinental Railroad had just been finished (1869) while eastern systems focused on reaching Chicago. One notable was the Baltimore & Ohio, America's first common-carrier, which arrived in the Windy City in 1875. While the construction and consolidation of carriers west of the Mississippi was still ongoing, back east the railroads we now commonly refer to as classic "fallen flags" were either already established or soon to be. In an era prior to government oversight, arrogant and pompous owners continued (although in declining numbers) to cause inefficient operations by refusing interchange and maintaining their own track gauge. 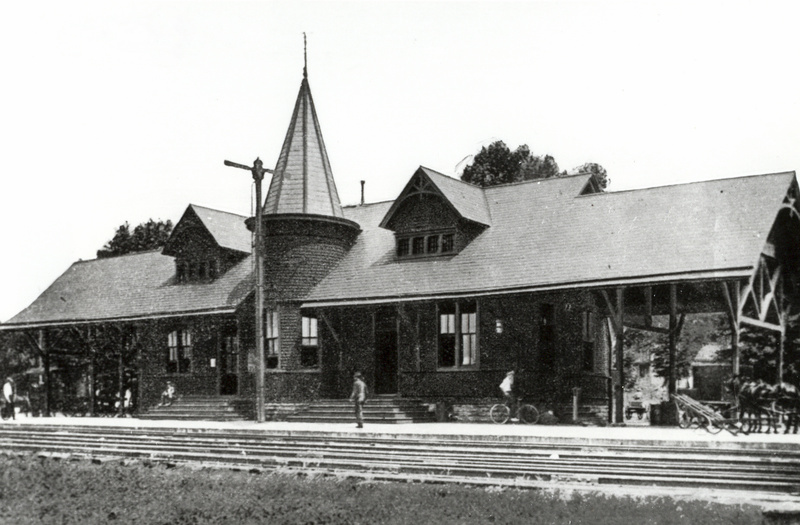 By the 1870's, American railroads were quickly transforming themselves into the modern incarnation we recognize today. Many of the well-known freight car types were already in service (boxcars, flatcars, hoppers, tank cars, gondolas, and the caboose). Passenger amenities were also vastly improving; the first diner appeared in 1867, sleeping cars were operating in ever-greater numbers, chair cars (a type of upscale coach featuring plush, reclining, swivel seats) were first used in 1875, and even central heating (via steam) was in the experimental stages. For all of these advancements, the decade had its problems. It began with the financial Panic of 1873. Railroads were growing so fast that nearly 6,000 miles were being laid down every year (17,000 miles between 1871 and 1873). With so much new construction, lending was strained and overextended. It ultimately collapsed when Jay Cooke's banking firm, Jay Cooke & Company, could not sell the $100 million in bonds needed for the Northern Pacific Railway's construction, our country's first transcontinental railroad into the Pacific Northwest. The NP failed on September 18, 1873, which set off a chain reaction of bank failures that led to a national depression. According to the book, "Railroads In The Days Of Steam" by authors Albert McCready and Lawrence Sagle, as a rare federal charter Northern Pacific was provided 25,600 acres of public land for each new mile constructed. Following its bankruptcy the government attempted to revoke this charter but such draconian measures were spared when new ownership managed to procure further funding and see its completion by 1883. Economic issues were not the only concern facing railroads: America's Heartland was filled with angry Native Americans who were not happy about the White Man's encroachment onto their lands. Whenever possible they routinely destroyed track, derailed trains, and disrupted operations. It was a serious problem during Union Pacific's construction in the 1860's as grading and track crews were constantly harassed. In response, the U.S. government provided military support. After several years of bloodshed, capped by the famous Battle At Little Big Horn where Colonel George A. Custer's Seventh Calvary was annihilated by the Sioux Nation (led by Crazy Horse), most of the fighting had ended by 1877. The 1870's also saw new Midwestern startups like the Atchison, Topeka & Santa Fe pushing westward across the plains and into the southwest. 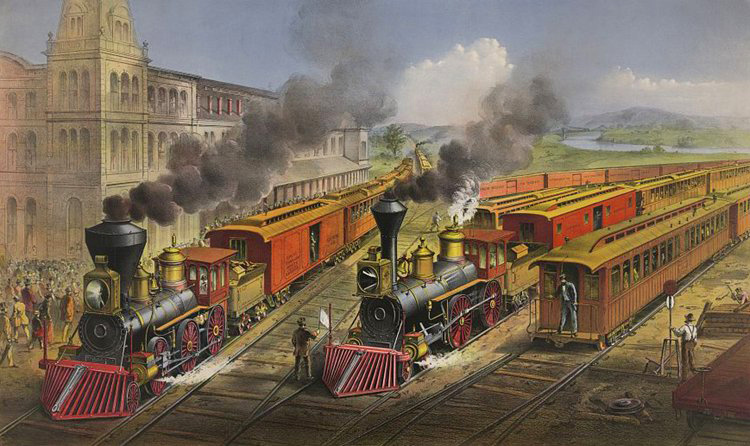 According to Keith Bryant, Jr.'s excellent book, "History Of The Atchison, Topeka & Santa Fe Railway," the AT&SF began as the Atchison & Topeka Railroad of 1859. After spreading across the Midwest, new leadership under William Barstow Strong in 1877 allowed it to reach California by 1883. The Southern Pacific was also feverishly building that decade, working its way east from the San Joaquin Valley towards the Gulf Coast. The SP served most of Southern California by the end of the 1860's; under the leadership of Collis P. Huntington it reached El Paso, Texas in 1881 and New Orleans, Louisiana soon afterward. This corridor became its legendary "Sunset Route." While westward expansion was underway railroads also grew prodigiously back east. As the 1870's dawned, Southern railroads were still recovering from the Civil War's ravages. But within a decade they had rebounded handsomely, gaining 55% of their 1870 mileage (or, over 19,000 miles). The 1870's also witnessed the four major eastern trunk lines either complete their Chicago corridors or nearly so (Erie Railroad). The Pennsylvania Railroad had arrived decades earlier, in 1852, while the future New York Central System provided a direct link in 1873 when owner Cornelius Vanderbilt named himself president of the Lake Shore & Michigan Southern. The Baltimore & Ohio reached the Windy City a few years later, in 1875, although indirectly. The following was written by James Macaulay and published in London's, "Across The Ferry" in 1887. It was reprinted in August Mencken's book, "The Railroad Passenger Car," and describes what it was like to ride in a Pullman car during the 1870's: "The average speed on the American lines is about twenty miles an hour. The express trains rarely exceed thirty miles. Nominally, there i but one class of passengers and one scale of fare. Every traveler takes his place where he has a fancy except that there is a car reserved for ladies and for gentlemen accompanying them. But though in theory all are equal there are practically various classes of immigrants. There are attached to most trains drawing-room cars, reclining chair car and sleeping-cars, for which additional charge is made. Some of these select cars belong to speculating builders or companies who purchase the privilege of attaching them to the trains and make their profit by the additional charge. The most notable of these speculations are the Pullman hotel-cars. In one of these I traveled from Niagara to Chicago, leaving in the forenoon and arriving on the morning of the following day. Two of us chartered a compartment like the cabin of a ship with a comfortable sofa above which a board was fixed at night, so as to form a second sleeping-berth. The beds are regularly made, boots put outside the door for cleaning, and hot water brought in the morning by an active black boy. Meals were served on a table carried into the cabin. The bill-of-fare contained many items and at moderate charges. For lamb chop or mutton chop and tomato sauce the price was seventy-five cents; fresh mackerel, fifty cents; omelet with ham, forty cents and a spring chicken cost a dollar. There was ample choice of vegetables, fruit and relishes with five or six kinds of wine in the carte. A cup of French coffee, tea or chocolate was fifteen cents. The kitchen, clean and commodious, had every appliance for cooking, and the dressing compartment was equally convenient. Some of the drawing-room cars are as luxurious as those of royal or imperial carriages on European lines, with mirrors, lounges, chandeliers, piano and bookcases. A novelty in some of the cars on the Pacific Line is an outside balcony from which the scenery can be surveyed. In America the ingenuity of the directors seems to be exerted for the comfort of the poorest classes. The carriages are large and well ventilated, with stoves for wintry weather and Venetian blinds and sun shades at every window in Summer. The seats are roomy and well cushioned. For parcels or small packages there are plenty of pegs and wire racks, and there is a barrel of filtered water, iced in Summer, at one end of the car. Notwithstanding all this, there is room for improvement. The jumping and jolting of man of the lines is terrible. The rails are laid upon big wooden sleepers which seem often of needless irregularity in level. Great is the dust and glare in hot weather and the draft in cold weather. Except in the larger towns and at the hotel stations the depots are generally very plain wooden structures, with few fixings and at night cheerless and ill lighted." According to the book, "Baltimore & Ohio Railroad" by Kirk Reynolds and David Oroszi, the B&O's through route, via Pittsburgh, was not established until 1891 thanks to the efforts of President John W. Garrett, who became the railroad's seventh president on November 17, 1858. Upon the road's push towards Chicago he stated, "...he would pull down the temple of high freight rates upon the heads of rival lines like the biblical Samson." The Erie Railroad was the last, making its entrance during the 1880's via acquisition of the Chicago & Atlantic Railway. The standard track gauge of 4 feet, 8 1/2 inches became increasingly common during the 1870's although numerous widths still persisted. For instance, roughly six different gauges could be found throughout the country: 4 feet, 8 1/2 inches (found predominantly in the Northeast and Midwest); 4 feet, 10 inches (Ohio); 5 feet (South/Southeast); 5 feet, 4 inches; 5 feet, 6 inches; 6 feet; and the Pennsylvania Railroad used a gauge of 4 feet, 9 inches. As a historical footnote, the gauge of 4 foot, 8 1/2 inches was adopted from England; that country's horse carriages largely used this width and so the concept was applied to early railroads of the 1820's. The 1870s' final significant development was the adoption of Standard Time Zones. Since the actual time of day could vary greatly, from a few minutes to several (depending on one's location), a better system was needed. This was particularly true following the Transcontinental Railroad's completion where the western time differed by hours. Such an arrangement made it impossible for railroads to precisely coordinate schedules, an issue they didn't particularly mind at the time given the rabid level of competition. According to the book, "The Railroad Passenger Car: And Illustrated History Of The First Hundred Years With Accounts By Contemporary Passengers" by August Mencken, Charles Ferdinand Dowd was the first to propose a standard time within a pamphlet he published in 1870 entitled, "A System of National Time for the Railroads." This piece became the basis for the industry's standard time. Dowd was an 1853 graduate of Yale University (boasting a doctorate) who believed the country should be divided into four sections. These segments would cover 15 degrees of longitude, or an hour of real time. As the years passed the idea slowly gained traction although more than a decade would pass before it found widespread use. In 1876, William Allen, secretary of the Time Table Convention (which later became the General Time Convention), planned the four major time zones railroads would use. The 1870's witnessed a unique phenomenon take root, the narrow-gauge railroad. While the Erie had been built to 6-foot gauge; 5 feet was standard in the South; and 4 feet, 9 inches adopted by the Pennsylvania Railroad, a growing consortium in the post-Civil War era believed narrower gauge operation could save considerable construction and operational costs. While these widths had been used for some time in other parts of the world, notably Britain where Isaac W. Boulton showcased a 2-foot gauge locomotive on 1 mile of track near Wigan, Lancashire in 1861, it did not gain considerable traction in America until trade publications (principally Railway Age) picked up Robert Francis Fairlie's paper on the subject entitled Railway Gauges. His writing strongly touted the advantages of the 3-foot gauge. General William J. Palmer, a decorated U.S. Army officer of the Civil War, was already so convinced of its advantages he went his own way and swiftly organized the Denver & Rio Grande Railway on October 27, 1870. 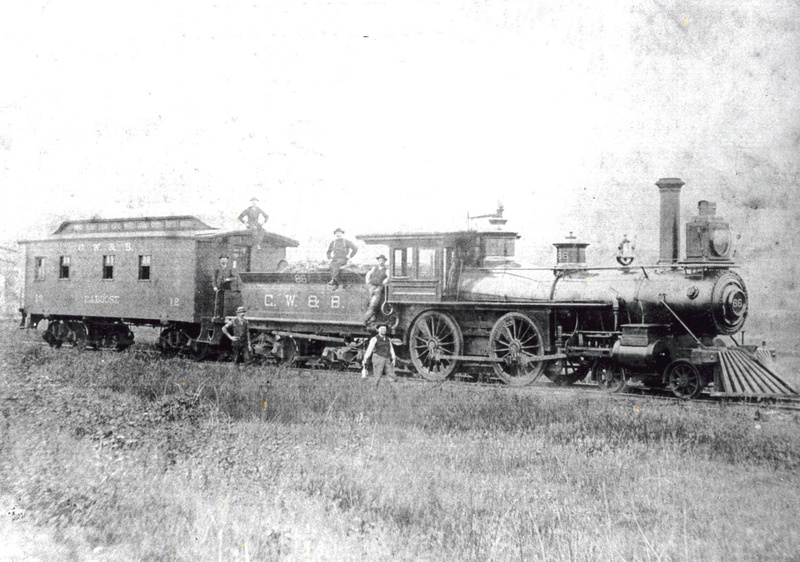 The D&RG became America's first, and most successful 3-foot railroad; by 1887 it boasted 1,673 miles in operation throughout Colorado according to Dr. George Hilton's book, "American Narrow Gauge Railroads." 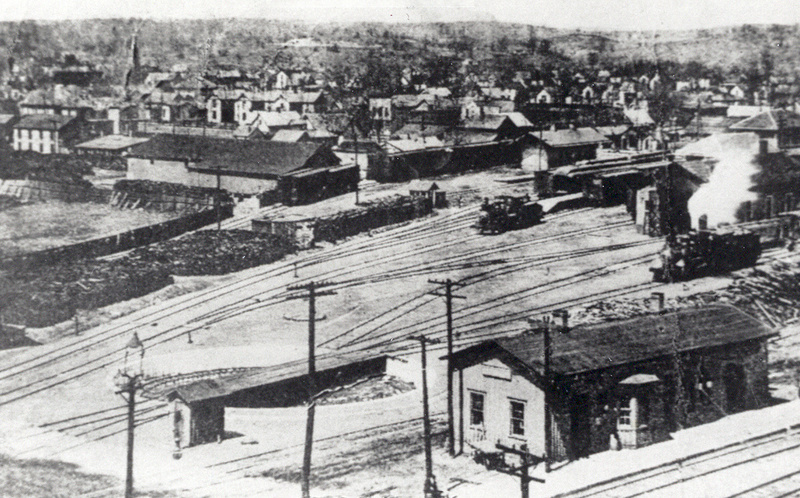 Narrow-gauge construction reached a fever pitch during the 1880's but its apparent advantages were quickly dashed; many were built very poorly and interchange with standard-gauge railroads made it very inefficient. Most were converted to 4 feet, 8 1/2 inches by the 1920's. Surprisingly, components of what later became the Denver & Rio Grande Western survived until 1980! They were listed by geographical location: Eastern, Central, Mountain and Pacific. These zones lay along the 75th (Eastern), 90th (Central), 105th (Mountain) and 120th (Pacific) meridians. Following more effort and work, significant organizations pushed for Standard Time's passage including the American Association for the Advancement of Scenic, American Metrological Society, and American Society of Civil Engineers. Canadian Pacific's chief engineer, Sir Sanford Fleming, took an even bolder step, stating in 1879 that a similar system should be used worldwide. Finally, the American Railway Association, the industry's trade group at the time (which became the Association of American Railroads on October 12, 1934), adopted the proposal and it became effective on November 18, 1883. Dowd was recognized for his efforts by being awarded a lifetime pass on any railroad. In an ironic and cruel twist of fate, he was killed by a train at Saratoga, New York on November 12, 1904. Jon Wright, "The Wright Photography Of Things"
© Copyright 2007-2019 American-Rails.com. All content copyright American-Rails.com (unless otherwise noted). All photos and videos, copyright individual owners/organizations.